It’s the final four! And despite my propensity to slam and jam up and down the block with the hot rock, I’m not talking about basketball. I’m talking about fangames! Actually, no wait, what AM I talking about? I’ll get back to you on that. It’s crazy to think this used to be a boxy, empty environment. My, what a difference a year makes. Last year, I criticized Sonic Small World for having boxy, simplistic environments. And it did! 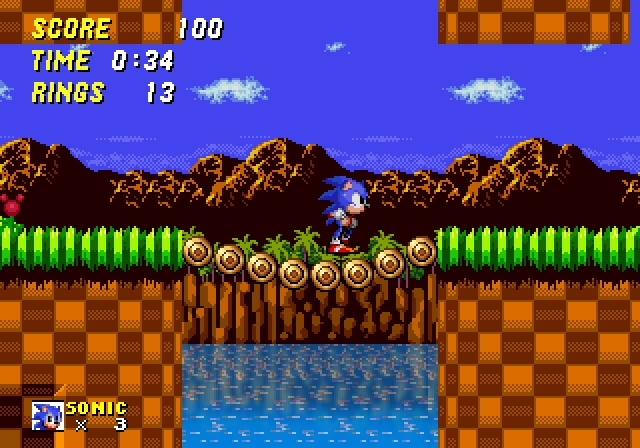 But Core has spent quite a lot of time making this level feel much more organic, and the end result is what might actually be some of the best level design I’ve seen in a 3D Sonic fangame. In some ways it still feels a little basic, though – for a 5+ minute level, there are only two major hazards present in the level, and they get kind of old rather quickly. A little more variety in this department would do wonders. I also take issue with the controls a little bit; as is the case in a few games here at SAGE, Sonic feels a little too sensitive. His gravity is pretty heavy, and if you finesse the controls the right way he can basically turn on a dime, giving Sonic the simultaneous contradictory feeling of being very heavy but also weightless at the same time. A little bit of an analog dead zone would help matters greatly as well, as on multiple occasions Small World was receiving input despite the fact my analog stick was currently centered. And despite improvements to level design aesthetic, pacing could use some work, too – the level doesn’t really feel like it builds up to an ending, you just turn a corner at some point and find the goal ring. But in the face of these criticisms, let me say this: if we gave out individual awards for SAGE games, Small World would be a contender for most improved game at the show this year. Give it a look. 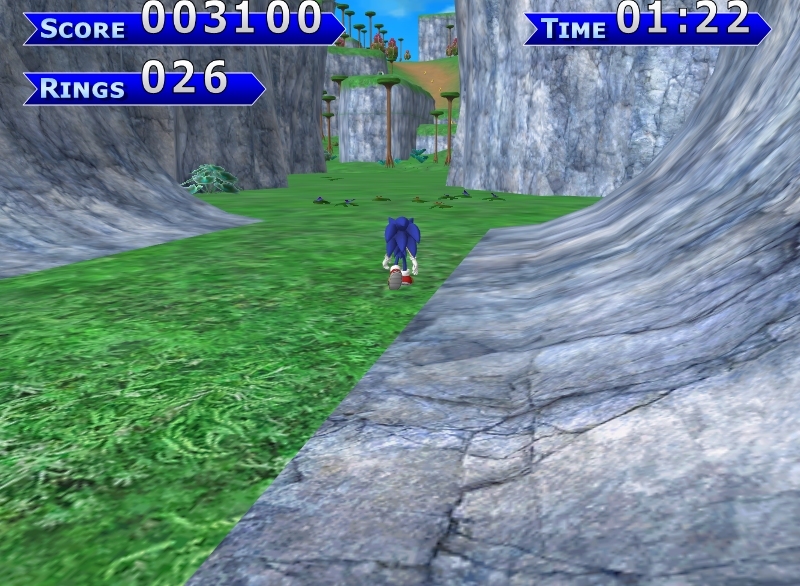 Sonic Panic strikes me as the kind of game that would’ve been a lot more impressive to me if I hadn’t just spent an entire week playing Sonic fangames. 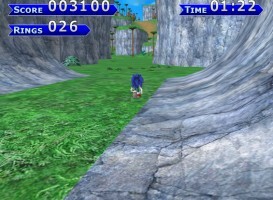 There is nothing really wrong with Sonic Panic at all; level design can be a little cheap at times, the boss fight is a little boring (waiting around for the boss to attack so you can counter-attack is always the worst), but in general the entire game is absolutely and entirely serviceable. Which is kind of the problem, in a way, because there’s not much here that stands out. I can’t help but feel like that’s a really awful thing for me to say, because then I get this picture in my head of the guy who made this game trying to make it more “unique” and completely ruining the good thing he has going here with some half-baked gimmick. I don’t want that to happen, because as I said earlier, there’s really nothing wrong with it. I’ve reviewed a game like this before one year at SAGE – “Sonic GEDA” – and after calling it average, Sonic GEDA slipped quietly in to the night and was never heard of again. Last year, I said similar words about Sonic Mobius, and that’s not here this year, either. I don’t want any more blood on my hands! I just don’t know what else to say! 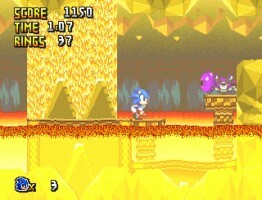 The special stage seemed kind of cool, though. Miss that item monitor and you’re kind of hosed. Here’s something a bit different: a game that is not a platformer, and not about Sonic. 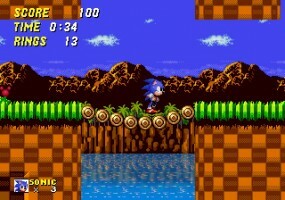 This one level demo puts you in control of Tails as he flies the Tornado through Aquatic Ruin Zone. 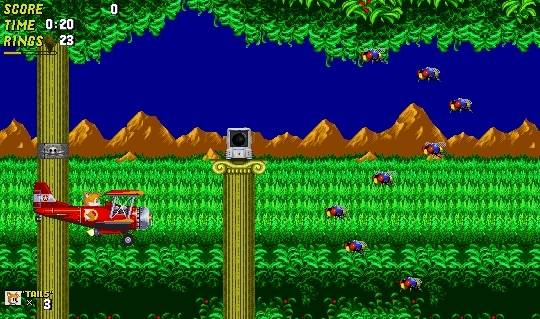 The rub is that these are the same sprites from the Sega Genesis games, so the sprite you end up controlling is actually fairly huge, and most of the enemies and hazards are very small. This creates scenarios where it becomes very easy to get hit, and the game’s finicky lock-on missile system doesn’t seem to alleviate matters any, as all too often the lock-on laser will pass right through an enemy or an important power-up. Assuming you can cope with this, you’ll get to the end of the level in a couple of minutes, and just like that, the demo’s over. To say this game needs a lot of work is an understatement; though the idea has its merits. Hopefully the author can pull it off. It makes sense that you can’t breathe under lava, but by that logic, you also shouldn’t be under lava at all. I have this picture in my head of LakeFeperd, the creator of this game, of being some kind of crazy workaholic. Not only did he have enough time to put together an improved version of last year’s “Before the Sequel”, but here we have a nice, meaty demo for “After the Sequel”. ATS contains parts of no fewer than six entirely separate zones – more than half of the total levels in the entire game, according to the level select screen. Not all of the levels seem entirely finished, either – one particular title card identifies the stage as “Castle Zone?” I feel like this is something Lake does a lot – if you’ve ever watched any of the trailers he’s released for BTS or ATS, they’re always 4-6 minutes long and show almost every stage in the game. It’s absolutely great that he has that much of these games done, but save a little bit for the final version of the game! This is a problem I ran in to with some of my own games years ago; show people too much of the final game and it’ll actually have an impact on how much fun they have when they actually get around to playing it for themselves. But I probably shouldn’t be complaining, because having more to play gives me more to talk about, and what’s here is pretty fun, if familiar. ATS doesn’t really seem to do much to differentiate itself from BTS mechanically, and many of the small, nitpicky complaints I had with BTS’s pacing are still present in ATS – the best of example of which is the aforementioned “Castle Zone?” which mysteriously turns in to an underwater level in its last 30 seconds even though nothing in the proceeding 3 and a half minutes suggested anything to do with water. Other, new annoyances raise their head, such as a level where Sonic dons a special shield to dive beneath the surface of a pool of lava. While that’s a cool idea on paper, all it ends up being is “water that makes it hard to see and hurts you if you jump in to it without a shield”. You even still have to collect air bubbles, even though you would think the shield would make that moot. Like BTS, ATS is a great game that just feels like it has a few things about it that are “off”. Still worth downloading, however. And that’s it! All games reviewed! I think I actually got through this SAGE without a single casualty – normally, I run in to at least one or two games that flat out refuse to work on my system. But not this year! It truly is a SAGE miracle. See you next year, guys!